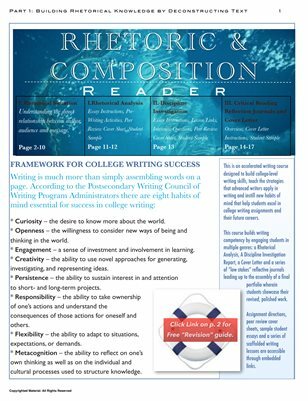 Rhetoric and Composition contains the same complete course content as College Composition only without the Critical Reading Reflection formal essay assignment. Instead, this reader focuses on two formal essays: the Rhetorical Analysis essay and the Discipline Investigation report. This version also includes directions for a writing portfolio cover letter. The abridged curriculum in this reader includes an emphasis on reading, with reading lessons designed to support "low stakes" critical reading journals (to accompany an instructor assigned text). This abridged version allows for greater flexibility for instructors.